BT Series Dual Speed transitional A.C. soft start, reduced torque control. Now for applications with motor sizes up to 75 HP! Upgrade your standard 3-phase two-speed A.C. induction motors with smooth starting, smooth reversing, smooth low to high speed, and smooth high to low speed, all with NO TIMERS! Through the control of all 3 phases for reduced mechanical and motor stress, you can practically eliminate breakage and wear on drive trains, gearing, belts, etc. The BT Series Smooth-Move® 2 offers an easy and quick upgrade for new or existing 2-speed equipment. Two-Speed A.C. soft starts can be an electronic replacement for resistor ballasts, timers, fluid couplings, inductors and other electrical and mechanical systems used to “cushion start” 3-phase induction motors. The Two-Speed BT Series will even smooth out the previously rough transition between speeds! The controller can be used with single or multiple motors up to the total full load amperage rating of the model (see table below). Smooth reversing is accomplished with a reversing contactor. The Two-Speed BT Series allows you to adjust the starting torque (ACCEL) of the motor, the transitional torque control between the two speeds (DECEL), as well as the length of the time to reach full motor torque/voltage (TIME). A unique patented system “senses” motor transitions, via the contactor coil control signals. 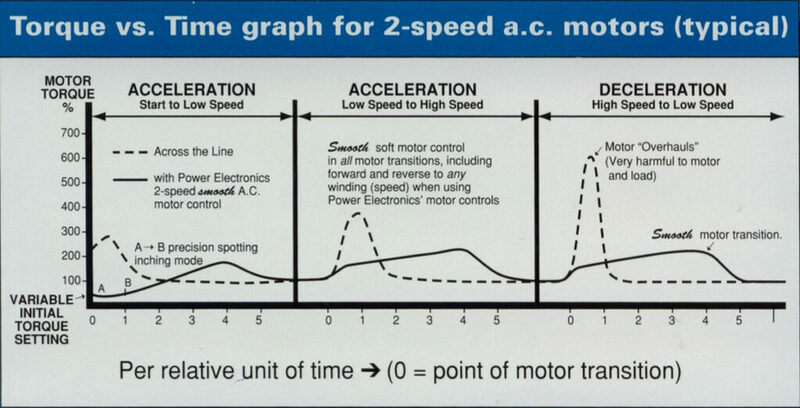 Two-speed 2-winding motors or 2-speed consequent pole motors will operate smoothly in all transitions and speeds (see comparison graph of 2-speed motor characteristics with, and without the Smooth-Move® 2 installed). ARC-ELIMINATION™ is an exclusive feature of the high-reliability Power Electronics® soft-start controls. This feature eliminates the destructive arcing on the make & break of power contactors. With the Smooth-Move® installed, the life of your contactors will be extended up to their mechanical limit, and IEC style contactors can now replace the more expensive NEMA style contactors in many applications. Additionally, the control will have very high reliability in tough applications. Only available from Power Electronics! For one-speed A.C. motor soft-start control in the 7.5-75 HP range, view the BT-Series® Single Speed. For applications with lower full load amp requirements (10 Amps and Under), see the Smooth Move series soft-starts. Completely custom control panels are available for your application. Call us today for a quote! How do I select the right Smooth-Move® for my application? If you have a single-speed or two-speed 3-phase motor, make sure you are looking at the corresponding single-speed or two-speed control unit models. Standard Smooth-Move torque controllers can be used at nearly any 3-phase voltage (208 – 460VAC). Models ending with “57” have an extended voltage range of 208 – 575VAC. The controller can be used with single or multiple motors up to the total full load amp rating of the model. Use the table to below to find the model that meets the FLA rating requirement of your motor(s). If your application requires higher amperage ratings than those listed here, view our BT Series of soft-starts. Contact PE® if you require any further help with selecting the correct controller for your application. Should I upgrade my motor controls with a Smooth-Move® or with a Micro-Speed® VFD? If you are looking to reduce wear on your motor and connecting components due to starting “kicks”, a Smooth-Move® soft start is a good economical option. However, as the name implies, a soft-start only helps with motor “starts”. The Smooth-Move controller is not intended for use in hoisting applications – VFD or closed-loop motor control is required in these applications. Also, if you need to control your motor speed while running, if you need to control the deceleration of your motor, or if you need your system to be capable of more advanced programming, a VFD will likely be a better upgrade option. View our line-up of Micro-Speed products here. Contact PE if you require any further help with selecting the correct soft-start or VFD for your application.